The Toltecs are the most mysterious and controversial group from ancient Mesoamerica and the interpretation of their importance to the greater cultural traditions of this region have ranged from seeing them as the “mother culture”, from which all others sprang, to a group that didn’t even exist historically, and were nothing but a figment of the Aztec imagination. When Cortes and his Spanish conquistadors arrived on the shores of Veracruz in 1519 the emissaries of Motecuhzoma II identified their kingdom as being that of the Culhua Mexica; that is, the “Toltec-Aztecs”. 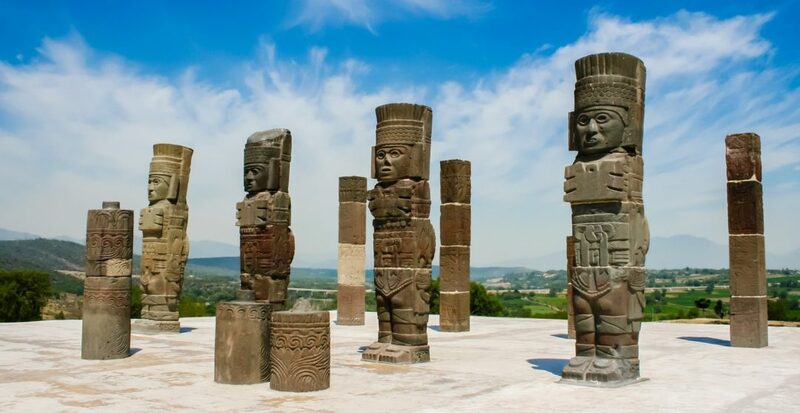 Our itinerary includes not only Tula, the legendary capital of the Toltecs, but also the great cities that preceded it, such as Cacaxtla, Xochicalco and, especially, Teotihuacán. But we will also visit the great sites of the Aztecs who wrapped themselves in the cultural mantle of the Toltecs as they formed their own empire in Central Mexico. Dr. Stanley Guenter, our study leader, will discuss his latest research on the Toltecs, including specific dates for the reign of the most famous Toltec of all, Topiltzin Quetzalcoatl, for whom Cortes was mistaken in 1519. Join us on a fascinating tour exploring central Mexico Toltec ruins, archaeology, history, and modern culture of one of the most important cultural regions in the Americas! Day 1: Depart the USA. Arrive Mexico City. Museum of Anthropology. Day 3: Cacaxtla. Huejotzingo Monastery. Cholula. Day 7: Tlatelolco. Templo Mayor. Day 9: Tenayuca. Santa Cecilia Acatitlan.